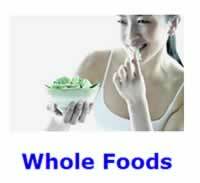 Everyone should plan to meet his or her calcium needs from eating a healthy whole-foods diet. Calcium rich foods help to prevent hardening of the arteries as you age. Most people wrongly believe that they cannot get enough calcium from a diet of vegetables, fruits, whole grains, and nuts. Still, dairy is not a recommended food source for calcium due to the high saturated fat content of most dairy products. Milk is not the best source of calcium. Furthermore, the milk sold in most grocery stores is largely adulterated and full of hormones and even antibiotics that were given to cows to keep them healthy. America's obsession with drinking milk is mostly the result of marketing hype and a strong dairy lobby. Do not sell a plant-based diet short. There are many good plant-based sources of calcium. Since calcium helps to build strong bones, it should not surprise anyone that fish with edible bones are an excellent source of calcium. Try eating canned sardines, mackerel, and salmon along with the bones that are usually soft enough to eat. Small ocean fish are an excellent source of minerals in general, such as iodine and selenium. Next, greens, are a fantastic source of calcium. All greens should only be eaten after they have been well cooked in order to minimize the mineral-binding effects of their oxalic acid content. Collard greens - They are staple vegetable in the Southern United States diet that stores well when refrigerated. Kale - Kale is the staple of the greens and contains over 45 different flavonoids. Kale can be mixed served in a variety of different ways, such as with mashed potatoes. Mustard greens - These greens have a distinctive, sharp peppery taste to them. Mustard greens are often sautÃ©ed. Turnip greens - They have a bitter taste and are often served steamed. Avoid eating spinach on a regular basis because it contains the highest amount of oxalates of all the greens. The bioavailability of nutrients consumed in food is an important issue in nutrition. Calcium and magnesium oxalates effectively blocks, or reduces, the absorption of minerals from your diet. Bok choy is an amazing member of the brassica family of vegetables that is very popular in Asian countries. Add Bok choy to your diet for more variety and better nutrition. Seeds and nuts in general are good sources. Almonds and ground chia seeds in particular contains large amounts of calcium. Whole carrots, as well as juiced carrots, are an excellent source of minerals in general. Homemade bread made with Black strap molasses contains surprisingly large amounts of calcium in just one tablespoon would be a good addition to your diet. Finally, bake beans; cowpeas; and navy beans are another great source. With the exception of chia seeds, all of these recommended food sources are already probably a part of your healthy whole food diet. Almonds and cold water fatty fish is an excellent source of omega-3 EFAs. Low-oxalate greens are eaten for their carotene and carotenoid content, while beans or legumes are a good source of fiber. After fighting hard to get as much calcium from a largely vegetarian diet as possible, why not promote its retention in your body by engaging in weight-bearing exercises, such as walking and enjoying the outdoors for ten minutes? This article was originally published during February 2012.